Remember those hunks of random patchwork I mentioned last time? I dug them out of the UFO pile and now I know what I’m going to do with them. Naturally it’ll be appliqué. Stay tuned! Before Elly’s lecture began (see the November 6 post), I was looking around the shop when I heard my name called. I turned around and, happy day! it was the podcaster extraordinaire Annie Smith, whom I hardly ever get to see due to her incredibly active traveling, teaching, and speaking schedule. Annie was teaching a class next door to our lecture and had just a minute before her class was going to start. “Did you see my coat at PIQF?” she asked me with excitement. I had to confess that although I had admired the garments, I missed entirely the fact that one of them was hers and also that the special exhibit “Off the Bed — On the Back” had been curated by one of my own guild members, Rachel Clark. 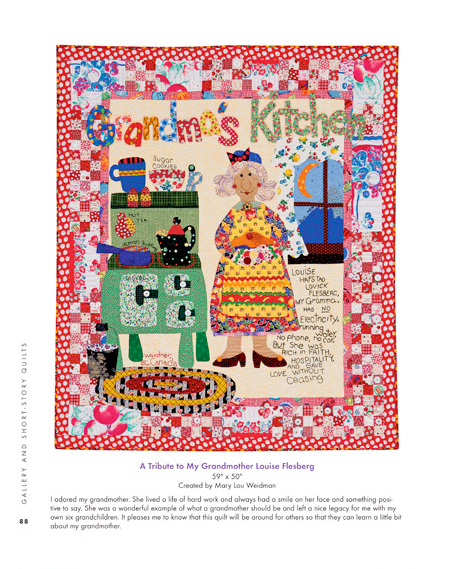 “Rachel asked me to be a part of the exhibit when she saw my West of Baltimore quilt. Each of the pieces in the exhibit was to be a specific technique of quilt making, (i.e. 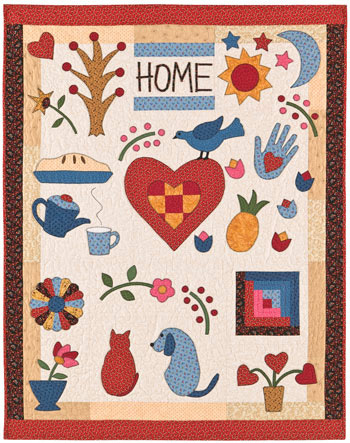 : log cabin, paper piecing, Hawaiian quilting, Baltimore appliqué — which was mine). 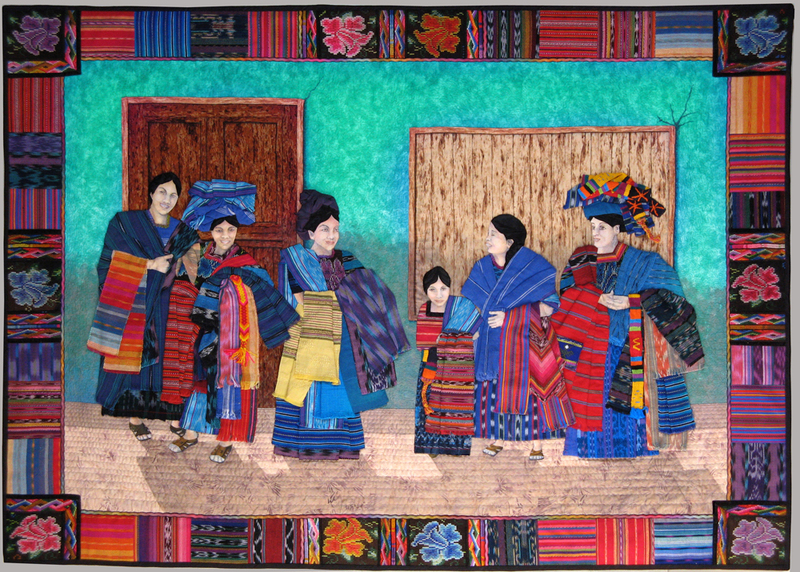 My quilter, Melodee Wade, quilted each of the coat pieces first, then the appliqué was designed and stitched to the coat. The hard part was that I was working like crazy to get the coat finished and Rachel asked me what the name of my quilt was. Oh yeah, I remember now… after a conversation LAST October…. 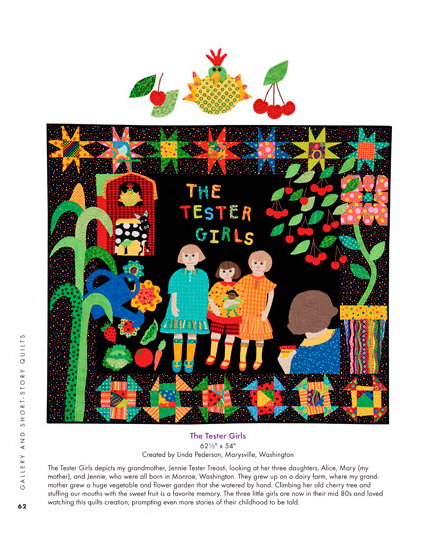 little quilts, the quilt design is put on the coat… yeah, right. So I stopped working on the coat design — I was having quilter’s block anyway after being seized with ultimate stress of doing a quilt too — and began the quilt. 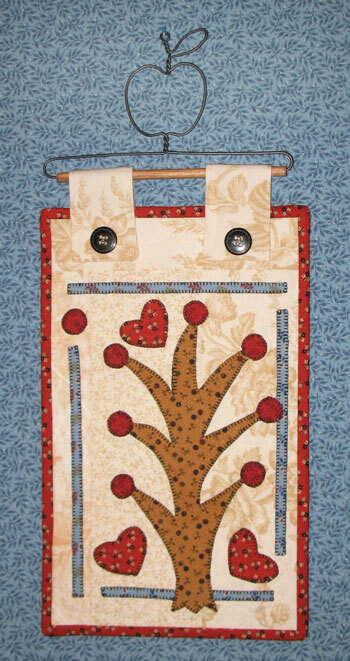 The vase in the center of the quilt is on the back of the coat, and then I wanted to do some simple vines for the border. Or at least, what I thought was simple. 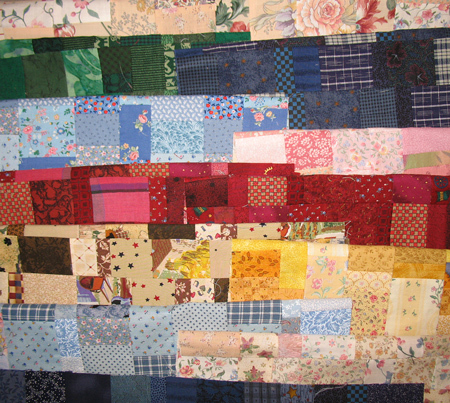 I have to remember that the quilt will always tell you what it wants, and the quilt just grew on my design wall. I knew when to stop and that it was perfect — when I added all of the little yellow dots as detail. My friend Aneda Phillips, who made the West of Baltimore pattern cover quilt, stitched all of the appliqué while I went back to finishing the coat. 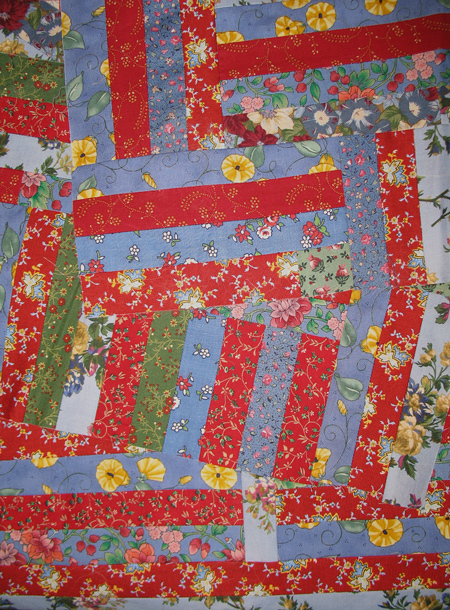 When she returned the pieces of the quilt so I could assemble it, I mis-cut the center [Ed. note: GASP] and had to make another one from scratch and do all of the stitching on it, as Aneda was finishing up her quilts for her Market booth. Then back to the coat. It had to be done in panels, appliqué then sew the seams together, then connect the design. 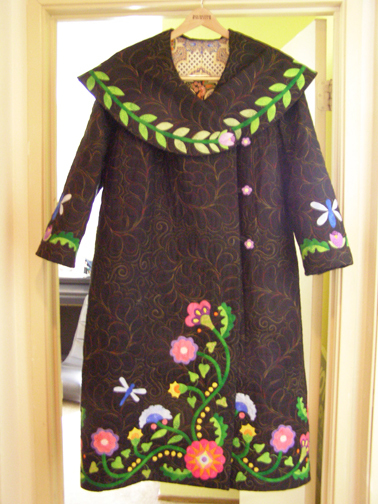 The hardest part was the two flowers that are on the side seams of the coat. At that point, the coat was wearing me while I stitched them down! 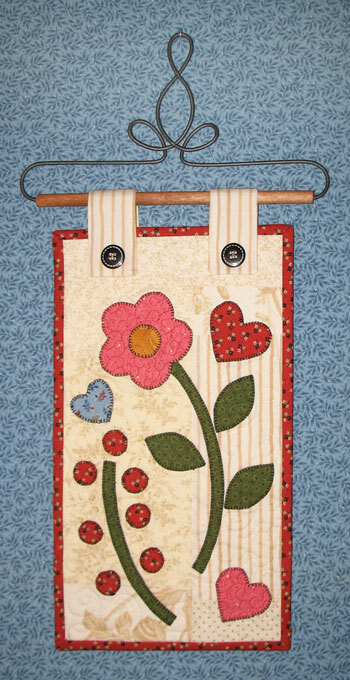 I do fusible, fine machine appliqué where I use a tiny blanket stitch and match all of the threads to the appliqué fabrics. 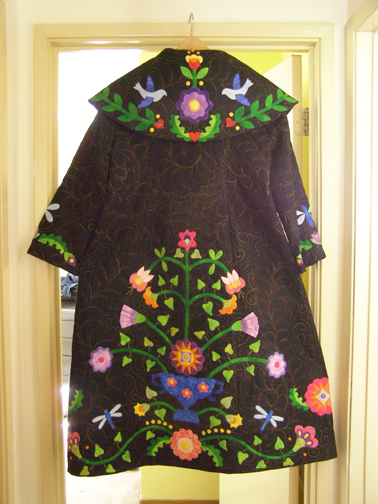 There is some hand embroidery on the quilt and coat. I even made covered buttons with little appliqué flowers on them. 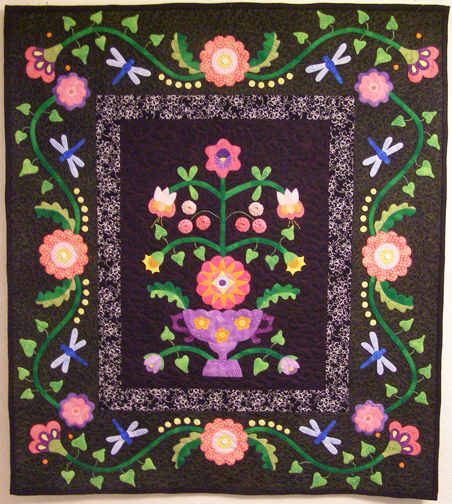 The name of the quilt is “Midnight in the Garden” and the coat is “A Rose Tree in a Baltimore Garden”. 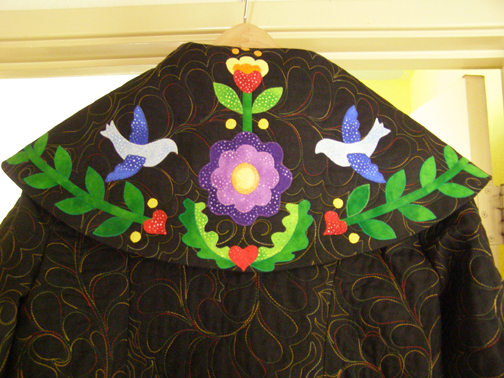 A Rose Tree is a traditional Baltimore appliqué pattern which I used for the shawl collar of the coat. The appliqué fabrics and coat lining were generously donated by Robert Kaufman Fabrics. 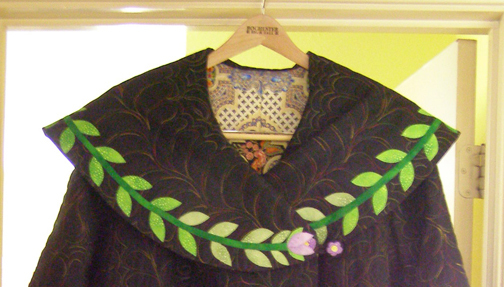 I used Peggy Toole’s “Florentine II” fabric as the lining and focus fabric for all of the appliqué. You can a little bit of the gorgeous lining fabric in the front collar picture. The fabric is amazing. 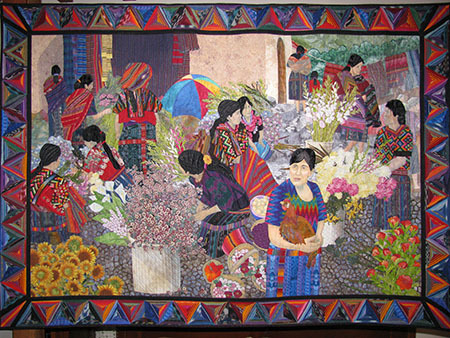 All in all, I worked on the quilt and coat for three weeks, 12 to 18 hours a day to get it done in time for PIQF. And then, I didn’t even get to attend the show, as I was teaching in Canada! 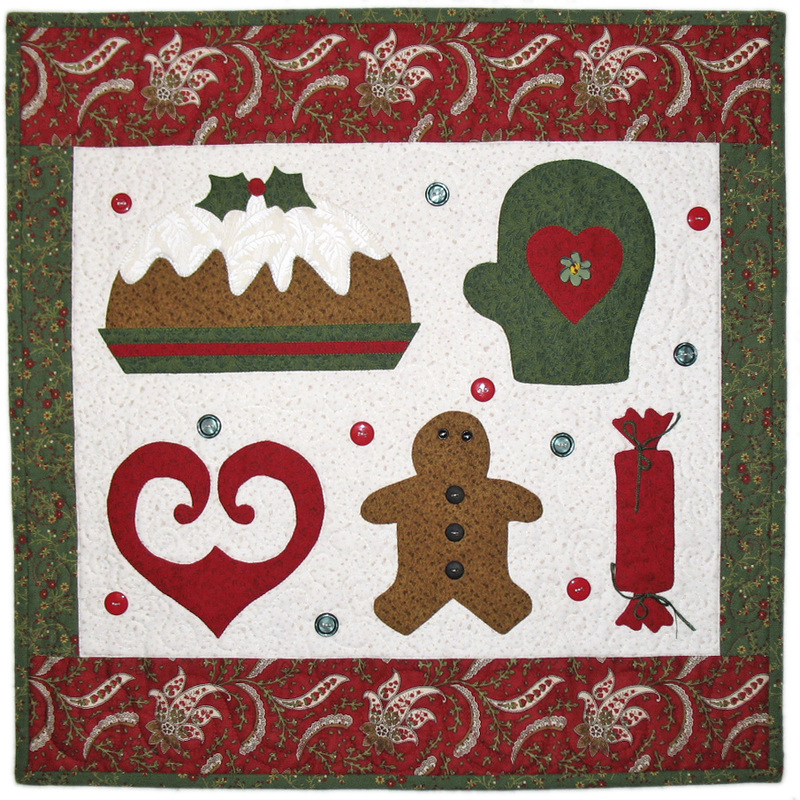 Melodee is an incredible quilter. I just gave her the pieces and let her do her thing. She did some neat swirled feathers in places that aren’t covered by appliqué — and that’s the thing, she had no idea where the appliqué was going. She just quilted as if they were separate whole cloth quilts. I was amazed when I sewed the panels together — the quilting from one dovetailed into the other and in some places it’s hard to see the seam line. I know that it was totally random, but I love when magic happens like that. Kay here… I’ll add that in addition to her quilting talents, Melodee is one of the nicest, most gracious people you could ever hope to meet. 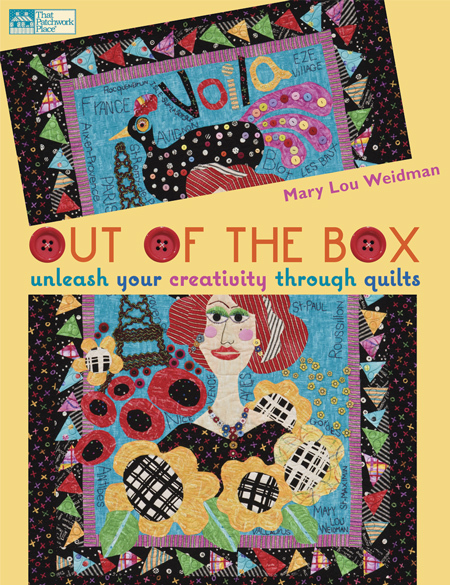 Her contact is melodeewade@aol.com if you’re interested in contacting her for your longarm quilting needs. On her latest podcast,(11/10/08), Annie tells more about the creation of the coat and jacket, describing how they grew on her design wall and what a wonderful experience it was for her to let go and let that happen. Go give a listen, and you’ll also hear a hilarious story of how dedicated a quilter can be when it comes to acquiring an industrial Bernina for $100. While I was at Quilt Market in Portland, I saw the display by Ackfeld Manufacturing of bunches of darling wire hangers, and it got my mind spinning with ideas. I ordered some of the little hangers and as soon as I got home I set out making some little quilts. 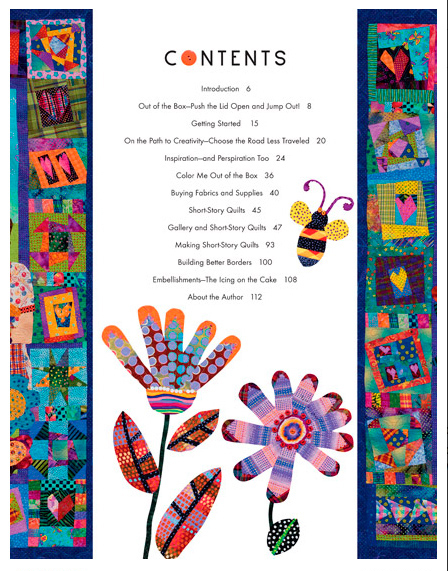 I love small things so this was a barrel of fun for me, and it also have me a chance to show off the motifs from my new book Home: A Heartfelt Nap Quilt and how you can use them different ways. These are all machine appliquéd with a blanket stitch, and I just used scraps left over from making the original Home quilt. I didn’t really plan anything out in advance, just chose the motifs and played around until I thought, ‘hey, that looks good,’ then fused them down. It’s great working this way in between fussier projects! Yesterday I took a workshop with Julie Hirota, an amazing appliqué artist and author of Art Glass Quilts. The last time she came to our guild, she taught her art glass, or “subtractive appliqué” technique. 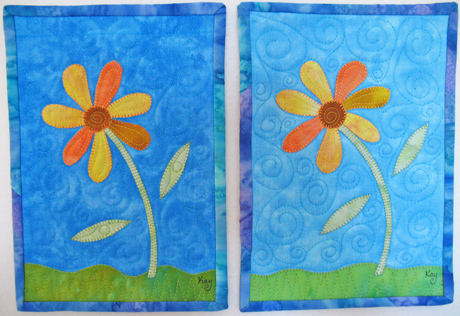 Now Julie’s in a mosaic phase, and today we learned how to go about creating these gorgeous art quilts. Here are some highlights from the day. We all made up our own designs. Here’s my improvisational mosaic flower. Janet was sitting next to me. Here’s her project in progress. And here’s Janet herself. She shared fabric with me. What a good workshop neighbor. 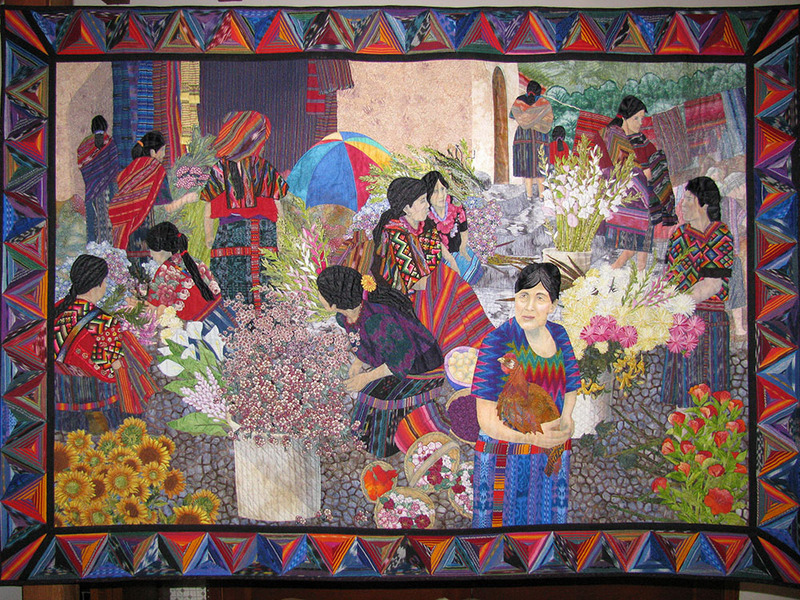 Julie Hirota, with her beautiful Queen of Hearts mosaic quilt. 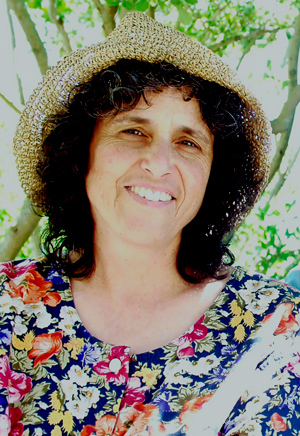 Julie’s website is www.jhiro.com. If you’re in the mood for some eye candy, be sure to visit. Her work doesn’t look quite like anybody else’s, and it’s stunning. Julie’s also into handbags lately (you can see some of them peeking out from behind her on the table.) They’re available at Julie’s Etsy shop. Thanks Julie! I had a great time! What are some ways of positioning appliqué motifs on the background fabric? This is where you don’t worry about matching the pattern too exactly, and just place your pieces where you like. Maybe you’re not even using a pattern, just creating a design as you go! Referring to the pattern, place your motifs on the background so that they look enough like the original for government work. Again, this is an admirable, freeing mentailty, and probably gives the blocks that attractive vintage look. If an appliqué design is set on the diagonal, you can fold and crease the background to provide reference lines for positioning the motifs. Now we’re getting to my territory (I have the curse of the precise. It’s not that much fun.) You can trace the pattern onto tracing paper to create a placement guide. Use vertical and horizontal centering lines to line up the guide with the background square. The Piece O’ Cake gals advocate using upholstery vinyl to make a placement guide. They’ve even started offering their own Quilter’s Vinyl by the yard, and there are instructions on how to use it, on their website. This is good for tracing the placement guides, of course, but is also an direct and ingenious way of placing motifs for machine appliqué. Once you’ve gotten all of your pieces fused and cut out, put your pattern on the light box, put the background fabric over it (lined up with centering marks) and place all of the pieces for the block at once. Carefully transfer to the ironing board for fusing. For dark backgrounds, you’ll need to use one of the overlay methods. 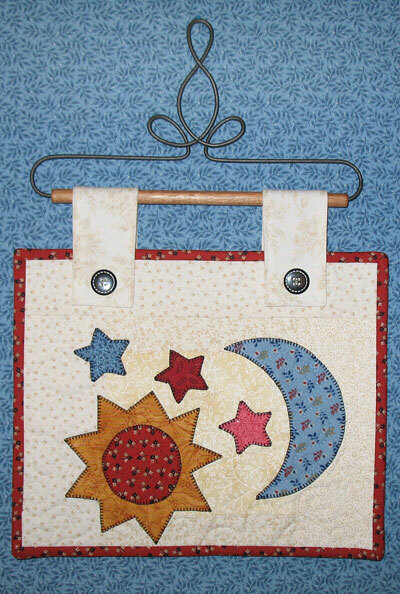 Okay quilters, what other ways are there to position your appliqué? There’s something about a lightweight interfacing overlay… help me out. I’ve heard of it but don’t know too much about it.